I knew today's challenge topic was going to be a tough one. There are quite a few things I miss. The innocence of youth, not knowing what the adult world is really all about, getting to read Harry Potter for the first time, and on and on. However, those are all incomparable to the people I miss. 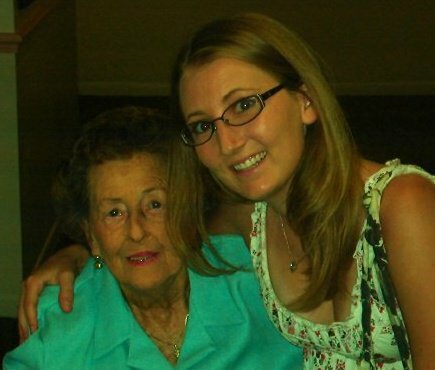 I miss my Mimi more than anything else in this world. I would love to have the chance to spend just one more day with her. Words really can not even express how much I miss her and how often I wish she were around. I am currently sitting in the John Wayne Airport. So in order to avoid an ugly cry in the middle of the terminal I am going to try to share little moments and memories that I miss about her in order to avoid the onset of emotions that will surely be brought to the surface if I share my feelings on the matter of missing her. - I miss sitting on her lap. I sat on her lap until I got so big the weight of me would have probably crushed her tiny little frame. 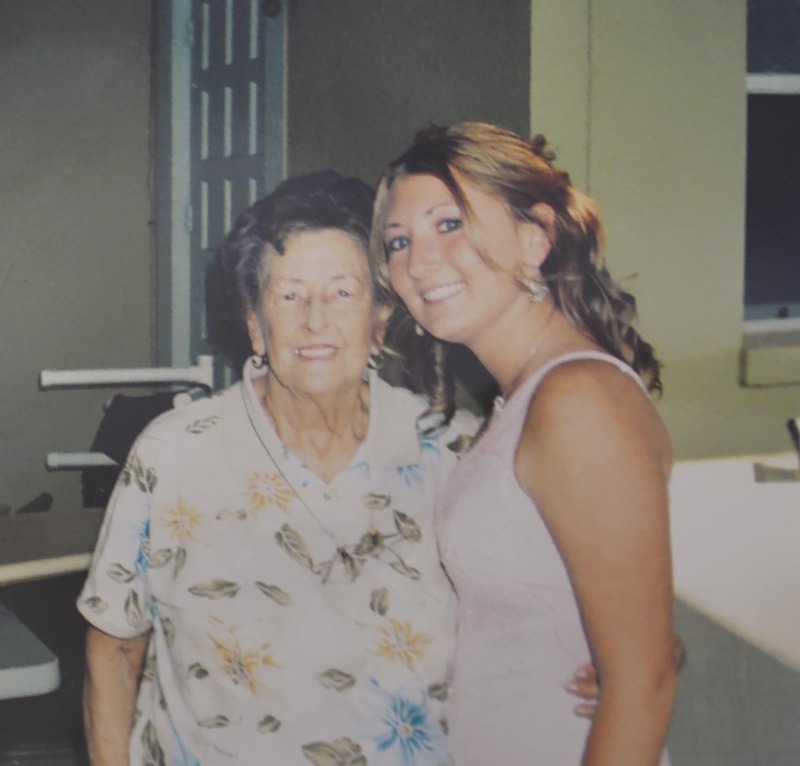 I think I think I may have been well into middle school and would still wake up after I had spent the night to go and sit on her lap in the living room where I knew she would be sitting and waiting. Even in college I would still manage to sit there from time to time; I just supported my own weight. - I miss spending the night with her. My friends still talk to this day about the fact that I would miss some of our weekend FCA (YMCA event) dances just to go spend the night at Mimi's house. Our routine consisted of going to rent a movie from Blockbuster while we waited for our pizza to be ready at Papa John's. She would usually give me cash to go in and pick one while she waited in the car. She would in up coming in because I was taking to long and our pizza was going to be ready. We would get our pizza, go home and watch Diagnosis Murder while we ate and then put our movie in and pop some popcorn. It's not often that I burn popcorn but when I do I smile, because Mimi loved burnt popcorn. - I miss the way she would always get in the bed smelling like Mimi and cold cream. I would watch her sit at her vanity taking off her make-up with cold cream. That smell still comforts me. When she passed and my mom asked me about what I may want, I chose to take (among other things) her cold cream. It's Neiman Marcus but I knew just getting any new jar wouldn't work. Her jar has her smell in their too. I wore it on my hands on my wedding day and some nights when I can't sleep I will breathe it in (it sits in the top drawer of my bedside table). Too much? I don't know. Either way it comforts me. - I miss that as I got older she seemed to get wiser. I am assuming she was always wise, I was just finally old enough to embrace it. - I miss her shocked expressions by some of the things that would come out of my mouth. I remember once that if it weren't for the fact that I am attracted to men, I might make a good lesbian because I think it would just be awesome to live with my friends for the rest of my life. I can still hear her say, "Melanie?!" while she took in a big breath of air. - I miss her constantly trying to get me into a dress. She always wanted me to wear dresses. I never was a dress fan. Even though she was gone by that point she had a part in picking out my wedding dress (story on that another time). - I miss just being with her. I miss visiting her. I miss laying on the floor to shout her name under the door. When she moved into her retirement community (which I will so be doing when I turn 60 because it is the total hook-up!) she didn't have a doorbell and would sometimes not hear when I knocked. So I would sprawl out on the floor put my mouth up to the crack under the door and shout "Mimi?! Mimi!! I'm here!". Really I just miss life with her. I wish she could be here as I navigate these adult waters because I know she would have so much to tell me and even if she didn't she would be able to comfort me by just being her. Ok, I think I am going to have to cut off there. The lump in my throat is now sufficiently grown quite a few sizes. This is so beautiful. What wonderful details. I miss my Nana. She was one-of-a-kind.